If you have Bermuda grass, then there’s a possibility that those brown patches in your turf come from the work of armyworms. Bermuda grass may be susceptible to these invaders, but they can become a problem in other lawns too. If you live in the Dallas/Fort Worth area and believe that you have armyworms in your lawn, give us a call. We’ll treat the problem efficiently and effectively, ensuring that your lawn is the nicest in the neighborhood. Armyworms are the larval stage of moths. They are tan or light green in the early months of their development. By the time they reach their full size between one and-a-half and two inches, the armyworms are a darker green or brown. Equipped with voracious appetites, these caterpillars are capable of consuming large amounts of your lawn, turning what was once a lush, green space into a brown wasteland. Just as annoying, these trouble makers may attack your vegetable garden, making it imperative to get rid of them. The evidence of an infestation frequently begins on the edge of the lawn. After being consumed, the grass blades will appear ragged. If the infestation is particularly large and voracious, then the blades may be eaten all the way to the ground. In these cases, the entire lawn can be consumed within several days to a few weeks. 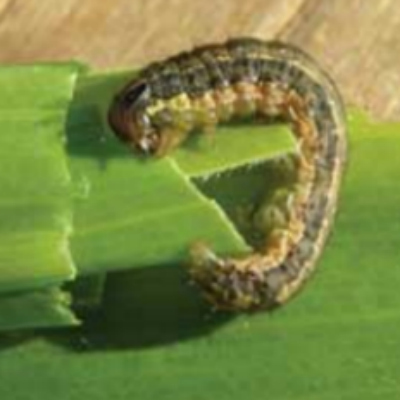 A cool, wet spring is often the catalyst for bringing on a summer with lots of armyworms. It is believed that they hitch a ride in to areas on large weather events like Tropical storms. They are usually active at night, resting during the day under garden or lawn debris. It’s not unusual for moths to be able to produce three generations of in a single season, which means that your lawn could be under continuous attack for months. Often, birds and insects are able to keep the population of armyworms under control. However, when these predators are few in number or when there is a particularly large outbreak, they may not be able to do enough to deal with the problem. That’s when it’s important to call in lawn care maintenance experts. If you’re worried that armyworms have invaded your lawn, give us a call about our Insect Control Program. We help homeowners and businesses get rid of these pests in efficient and reliable ways. Best of all, we rely on green practices that are safe to be used around people and pets. Don’t let armyworms get the edge. We can help you control them with our Insect Control Program. If you see them we can spray them before your lawn is ruined. A regular insect program can help keep them out of your lawn when they invade your area.